Comet Closet has raised $ 791 from 64 gifts! 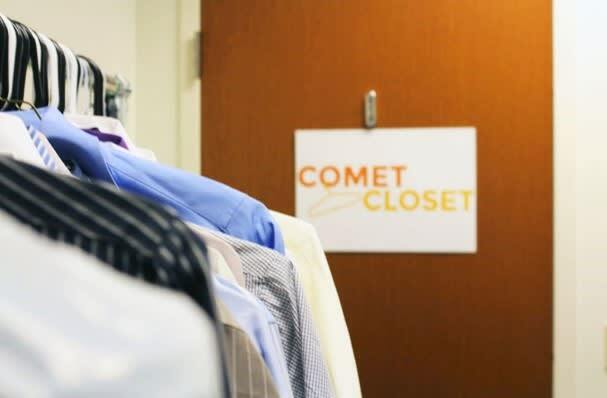 The Comet Closet is a donation based UT Dallas program that provides free professional attire to career-bound students. We help provide the education, developmental tools and professional attire that they can keep to land their dream job or internship. The Comet Closet has collected over 1,200 articles of clothing from faculty, alumni, students, and the Richardson community. However, we are still in need of many clothing items and sizes to help out all of our client’s needs. Spring cleaning is just around the corner! Please help fill in the gaps in our inventory by cleaning out your closet and donating your clothing that can help students land jobs. If there is nothing in your wardrobe that you would like to clean out, then please consider giving us a monetary gift, so that we may use your generous donation to purchase the items that are missing from our inventory! What items are we in most need of? For clothing donations, please drop off your donations at the JSOM 11.105F suite, JSOM 4.230 or email the cometcloset@utdallas.edu to set up a date and time for our student worker to help pick up your generous donation! 'Thank you very much for your time and commitment to our program and the UT Dallas student body!